Groupe US de Doo Wop originaire de Queens (New York), formé en 1955. Les "Cleftones" comprenaient : Herb Cox, Warren Corbin, Charlie James, William McClain et Berman Patterson. Ils ont enregistré entre 1956 et 1961 pour Gee Records. 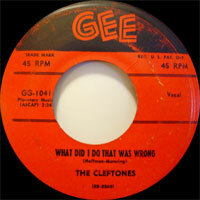 Formed in Queens, NY, in 1955, the Cleftones consisted of five friends from Jamaica High School -- Herb Cox, Warren Corbin, Charlie James, William McClain, and Berman Patterson. Originally signed to Gee, the group released its first single, "You Baby You," late in 1955; an up-tempo doo wop song, the record became a regional hit. "Little Girl of Mine," the Cleftones' second single, broke nationally, charting at number eight R&B and number 57 pop in 1956; two other similar singles, "Can't We Be Sweethearts" and "String Around My Heart," were released the same year, yet they failed to attract national attention. "See You Next Year," a ballad the group recorded in 1957, did not earn the group an audience outside of New York. Two years later, McClain left the group and was replaced by Gene Pearson from the Rivileers. Patricia Spann was also added to the Cleftones' lineup that year, which helped nudge the band away from traditional group-oriented doo wop harmonies and toward a Vocals sound that was dominated by the lead Vocalss. 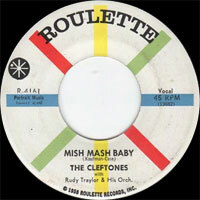 In 1961, the Cleftones realized the potential of the sound with their smash hit version of the standard "Heart and Soul"; it became the group's biggest hit, reaching number 18 on both pop and R&B charts. Later that year, the group had another hit with "For Sentimental Reasons," but the band had reached a peak with "Heart and Soul" and were never able to reach those heights again. 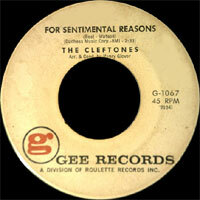 The Cleftones broke up in 1964, three years after their greatest success. 1957 SP GEE 1038 (US) See You Next Year / ?